Swimming pool building. - Construction de maison à Khao Lak-Thailande, maison à vendre, vend terrain et villa, house for sale in thailand, build builder house in thailand khao lak, land for sale khao lak,Property-Real Estate. 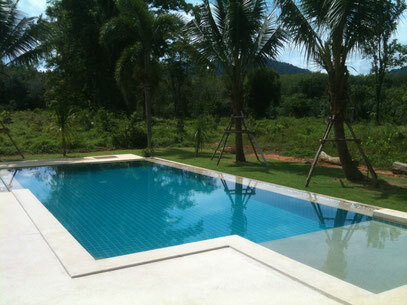 We build concrete pools, especially not fiberglass, plastic or LINEAR. Dimension is according to choice of 6m2 to 80 m2. A 20 sqm pool, skimmer system and concrete tiles. A 40 sqm concrete pool with tiles. Here in option, a baby corner or a sunbed place. 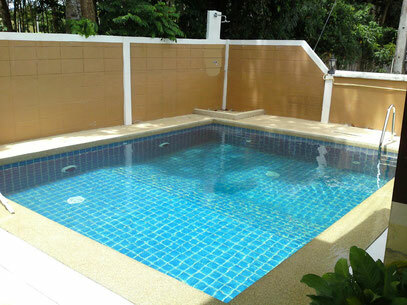 A 50 sqm pool in concrete with tiles and overflow. A 32 sqm concrete pool with a different king og overflow.